The first weekend in October will be a busy one in the Carlisle area! Farms, Fine Art, Fun music, Fast cars --- you can find all of these activities in Carlisle this weekend! The Fall Car show will draw thousands of car enthusiasts for the last event of the season at Carlisle Fairgrounds. The Cumberland County Farm Tour on Saturday will allow visitors to watch cows being milked robotically, catch a glimpse of rainbow trout at a trout farm, or buy some made-on-the-farm fresh ice cream. The tour is free. Come see what farming is all about in Cumberland County. The Carlisle Theatre will feature "Long Live The Beatles" on Friday night. A few tickets are still available for this fab four show! First Saturdays Art walk takes visitors to three wonderful art galleries in downtown Carlisle. First stop: Fly Away Home - Kimberlee Hanson's shop. 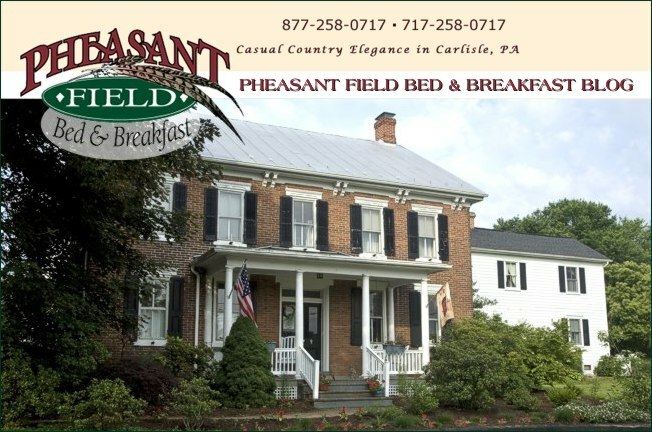 Kim painted the portrait of Pheasant FIeld that is featured on the cover of our cookbook! Next stop: The Garden Gallery then on to Nancy Stamm's Galleria.